The September issue initiated a new, smaller format (about 6″ x 9″) for SFD, a profile that it would retain with small variation for the rest of its run. The first reader letters reacting to Cosmos appear, accompanied by a two-chapter issue of the story in a single insert. Thos. S. Gardner, Johnson City, Tenn.
“You will find enclosed material evidence of my appreciation of you new serial, COSMOS. If it keeps up to the promise given by the first chapter, it is due to be one of the greatest classics of science fiction. I am afraid youngsters of 4 or 6 years would not be able to comprehend ‘Faster Than Light’ any more than they could understand any science fiction story. The new type is much clearer cut, and affords easier reading, besides increasing the number of words on each page. You will find it less straining on your eyes than the old type. This issue, September 1933, marks the beginning of our second year. During the past year it has always been our policy to publish only the most interesting and entertaining articles on the various phases of science fiction that we could find. When we departed from our non-fiction policy it was to give you one of the most original time-traveling stories ever written, “The Man Who Invaded Time,” by Raymond A. Palmer, and A. Merritt’s “The Woman of the Wood” which our readers enjoyed seeing reprinted. We had adopted our non-fiction policy at the request of our readers. At that time there were an ample number of magazines which published science fiction. Since then conditions have changed, and now there is really a shortage of science fiction on the market. After weighing the pros and cons on the matter we decided to adopt a new policy, and publish fiction. We cannot entirely make up for the shortage, but we are at least giving you he most unusual stories we can find. Stories that could be published in the leading fiction magazines, if they were not overstocked with manuscripts. The gap in science fiction publishing referred to was primarily the demise of Astounding Stories of Super Science, which published its last issue in March of 1933. Astounding had become a leading pulp in the field due at least in part to its publisher William Clayton’s policy of paying a premium rate for stories — two cents per word, versus the half-cent per word paid by older rival Amazing Stories. But the drought in “professional” scf-fi proved to be short-lived, as the Street & Smith publishing house acquired the William Clayton titles. Street & Smith were well-established with popular titles include The Shadow and Doc Savage. They resumed the publication of Astounding in October of 1933. 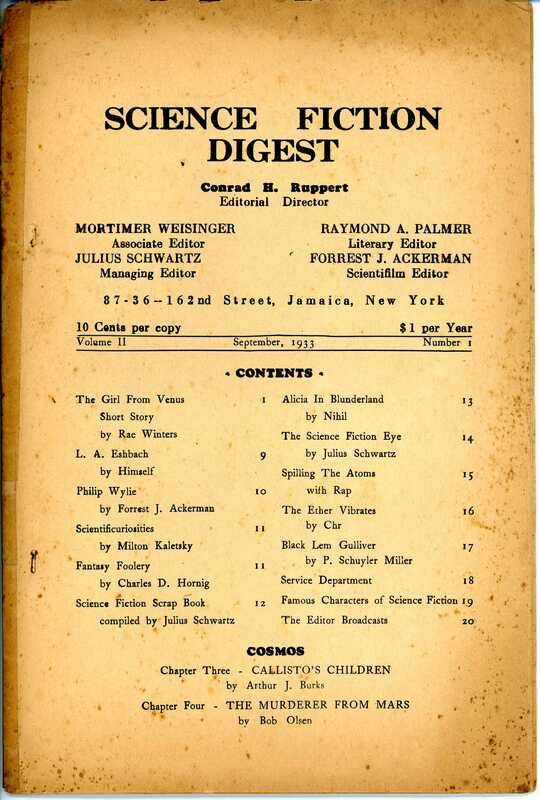 With yet another Cosmos connection, the editorship of the new Astounding passed in 1937 to John W. Campbell, author of Chapter 6 of the serial.